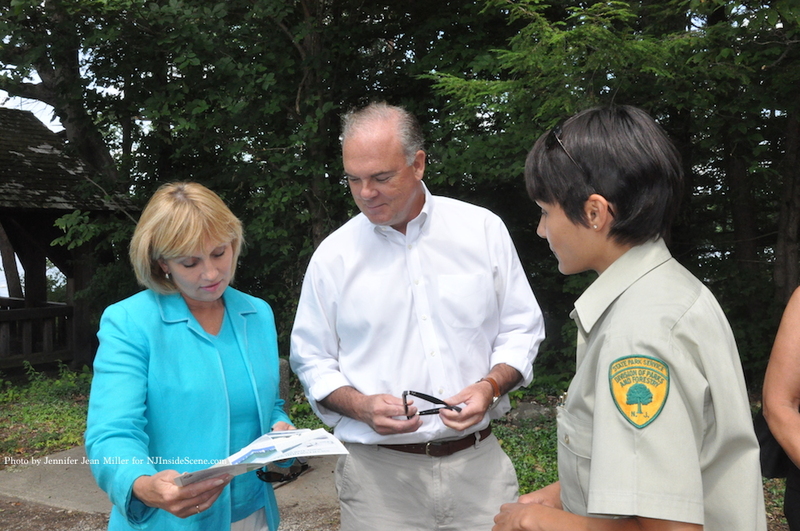 Lieutenant Governor Kim Guadagno (right), NJ DEP Commissioner Bob Martin (center) and Blanca Chevrestt the Superintendent of Swartswood State Park (right) review a map of the park that Chevrestt presented to Guadagno during her visit. Photo by Jennifer Jean Miller. 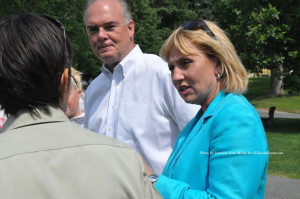 STILLWATER, NJ – New Jersey’s Lieutenant Governor Kim Guadagno toured Swartswood State Park yesterday, July 29, as part of an initiative that she has created, “Tourism Tuesday,” to accentuate New Jersey’s tourism facet. “This is really beautiful,” Guadagno remarked as she walked onto the beach of the 3,500-acre state park. Conditions were sunny and breezy yesterday, slightly cooler than expected for a July day in the Garden State. “What a perfect day,” Guadagno said. “You guys even turned the temperatures down ten degrees,” she quipped. Blanca Chevrestt, the park’s superintendent, led the tour. Other attendees included New Jersey Department of Environmental Protection Commissioner (DEP) Bob Martin, DEP Press Director Larry Ragonese, Sussex County Chamber of Commerce President Tammie Horsfield, Stillwater Mayor George Scott, State Park Service Regional Superintendent Steve Ellis, Governor Christie’s Deputy Press Secretary Kathryn Grosso, DEP Director Mark Texel, and others from Sussex County and Trenton. Lieutenant Governor Kim Guadagno shakes the hand of Sussex County Chamber of Commerce President Tammie Horsfield. Photo by Jennifer Jean Miller. 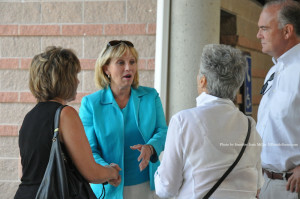 Guadagno’s tour kicked off with greeting the lineup of park employees on the beach, from park police to maintenance employees to lifeguards, who waited for her arrival. Lt. 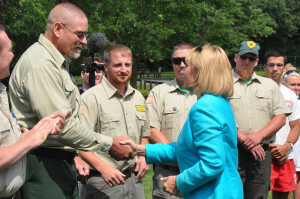 Governor Kim Guadagno introduces herself to park employees before the tour. Photo by Jennifer Jean Miller. After assembling a walk along the beach’s walkway, Guadagno and company took to the trails through the park, enjoying a walk under the canopy of trees, and stopping to sample some of the park’s raspberries, from a large patch within the forest that visitors often enjoy. The tour group was then led through one of the park’s pavilion picnic areas, made a stop by a wishing well, and then ended the tour at the main building and interpretative center, where the Lieutenant Governor viewed the exhibit on display pertaining to local wildlife. The Lieutenant Governor met with employees stationed at the main building, who were unable to be present at the lineup at the beach. Swartswood State Park was established in 1914 as the state’s first park, with the lake formed from a glacier. The park is accessible year round and in the summer, visitors can enjoy swimming, fishing, camping, hikes on the trails, and boating. Electric motors are the only type permitted on the lake, outside of canoes, rowboats, and kayaks. Boats can also be rented at Swartswood. “This is where people come to relax,” Chevrestt said. 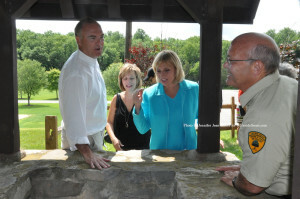 Lieutenant Governor Kim Guadagno and NJ DEP Commissioner Bob Martin speak with park superintendent Blanca Chevrestt. Photo by Jennifer Jean Miller. Chevrestt and Ellis pointed out to the group that aerators are in the lake, yet are powered by a large double-walled compressor that does not disrupt the visitors. Swartswood Lake and Little Swartswood are both stocked with a variety of trout each spring, and bass, sunfish, catfish, walleye, perch and pickerel swim among them. Officials pointed out to Guadagno, who lives in Monmouth County, the sands on the beach are “imported” shore sands. Swartswood State Park Superintendent Blanca Chevrestt (center) stops to speak with Lieutenant Governor Kim Guadagno (left) and NJ DEP Commissioner Bob Martin (right) after stopping to the large patch of raspberries within the park. Photo by Jennifer Jean Miller. 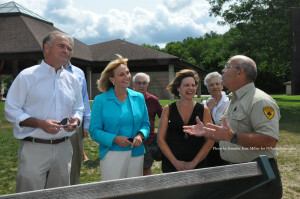 Guadagno especially marveled at the cleanliness of the beach and park, in addition to the site’s beauty. As the tour proceeded through the pavilion picnic area, Chevrestt explained that the staff cleans this area, for example, on a daily basis. The Lieutenant Governor especially noted that she did not see any geese around the area. Ellis and Chevrestt explained geese are shooed away daily from the areas, then are cleaned up after daily, in the areas where visitors congregate. The park employees are also diligent about weed control. 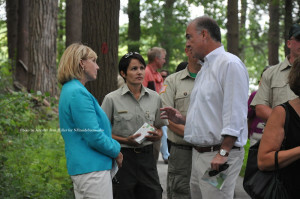 Regional Park Superintendent Steve Ellis speaks with NJ DEP Commissioner Bob Martin, Lieutenant Governor Kim Guadagno, and Sussex County Chamber of Commerce President Tammie Horsfield. Photo by Jennifer Jean Miller. “She runs a real tight ship here,” Texel said. The campsites are comprised of 65 tent and trailer areas, with five yurt sites. Yurts are tented areas with concrete floors, a skylight, and double deck bunk beds. Sites range for New Jersey Residents at $20 per night in addition to the park entry of $5 per person. Yurts are $35 per night for New Jersey Residents. The park is open for camping from April 1 through October 31. Chevrestt said the park is currently booked every weekend for camping during in what is now considered its “high season.” Chevrestt said campsites could also be booked online. 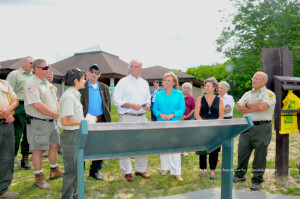 Blanca Chevrestt (left) superintendent of Swartswood State Park speaks about the park to dignitaries including New Jersey’s Lieutenant Governor Kim Guadagno. Photo by Jennifer Jean Miller. Horsfield also pointed out the Sussex County Chamber of Commerce’s partnership with the parks in the county, in assisting to keep the parks’ trails maintained. “It’s been a great partnership,” Horsfield said. During the tour Guadagno and Martin were gifted each with a couple of items. First, a special map that Chevrestt said is a waterproof and tear proof map of the park’s amenities and trails. Paul LaMarca, one of the park’s maintenance specialists, gave each a hand-carved fork made from a hickory branch. The Lieutenant Governor said she would treasure it and display it in her office with other souvenirs from throughout the Garden State. NJ DEP Commissioner Bob Martin, Sussex County Chamber of Commerce President Tammie Horsfield, Lieutenant Governor Kim Guadagno, and Regional Parks’ Superintendent Steve Ellis, stop to visit the park’s wishing well. Photo by Jennifer Jean Miller. LaMarca told NJ Inside Scene he was originally from Brooklyn, but was drawn to the life in the Sussex County area. He and other employees remarked how they like their work at the park, with their work considered not really work at all, because what they do is enjoyable. Many of them do special things to make the visit more pleasant for campers, such as movie nights, and other fun activities. 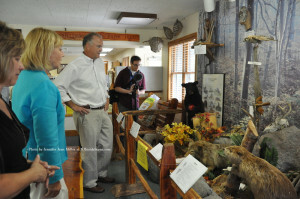 Sussex County Chamber of Commerce President Tammie Horsfield (left) views the display at the Swartswood State Park interpretative center with Lieutenant Governor Kim Guadagno (center) and NJ DEP Commissioner Bob Martin (right). Photo by Jennifer Jean Miller.